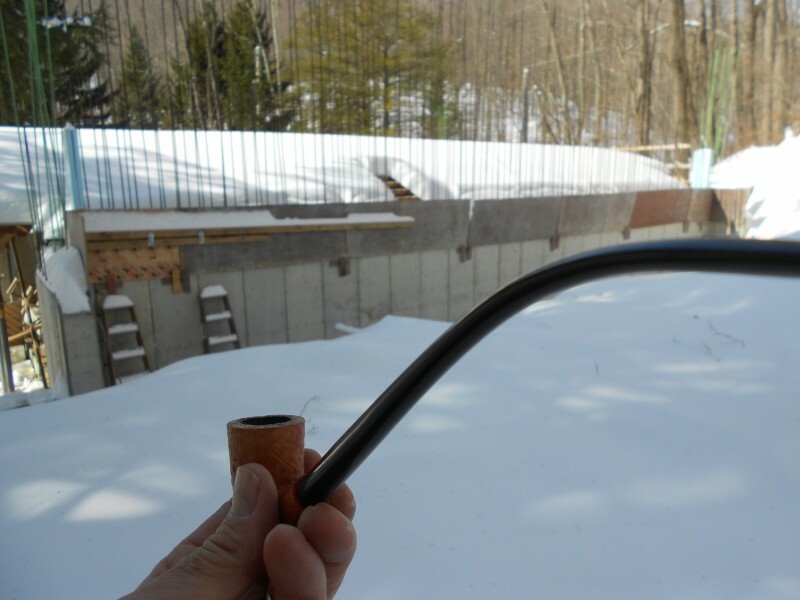 Of Pipe Weed and Another Foot of Snow. Just getting back to the snow they had said we were going to get 6-12 inches and that it would start early in the morning. Like around 2 AM. I went outside to go to work and we already had about 8 inches on the ground and it was like a blizzard outside. I figured we would have around 2-3 inches at the most by this hour. Thank goodness everybody stayed home. There was hardly a soul out on the roads. Speaking of which, I really don’t understand why you would drive in the snow if you are going to be a nervous wreck while driving. Please just stay home. Oh yeah, and how about that Super Bowl? What a disaster. I mean I wish every parent who is involved in Little League baseball, soccer, or any other organized sport could keep in mind that you can’t win all the time and that sometimes you do get destroyed by the competition. Even if you’re Peyton Manning. (and you earn millions of dollars a year!) It’s not that big a deal. To me it has always been like that poem by Rudyard Kipling: If you can meet with triumph and disaster….and treat those two imposters just the same. If you haven’t met them you haven’t been around very long….and you know what? Sometimes you just have a bad day. Everyone is entitled to a few of those. I could go on forever about adults and youth sports but I digress. Oh yeah we picked up Big Crash’s (aka Ethan’s) car Saturday. Boy, they did a really great job on it. It looks like it just came off the lot. It really looks that good. Big Crash is getting a ride back from college next weekend to pick up said car. My wife is so happy. Big Crash and Georgia are both going to be home next weekend! So let’s shift gears and get back to the topic of Hobbit house building and the like shall we? Just for a little perspective here’s a picture of what it currently looks like. 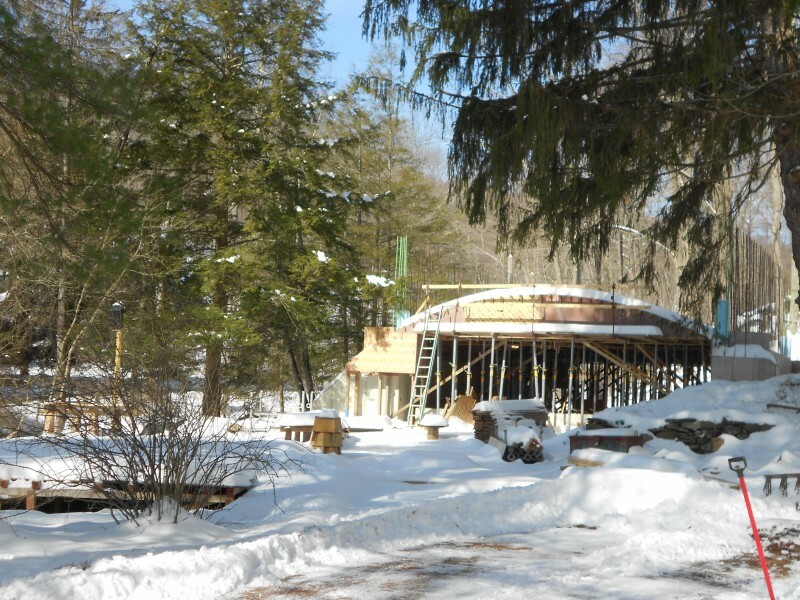 Site after 12 inches of snow. I did go back Sunday though. I figured I’d shovel my pathways to the house and gang boxes. Clear off the stuff that I’m going to need for the week. It actually took quite a while to do. Hopefully we’re nearing the end of the winter weather but I think the forecast has some snow for the upcoming week as well. Sorry folks but until we get a decent break with this weather and things start to melt you’re going to have to put up with me and my idiosyncratic ways. Apologies all around. So. We all know that Hobbits love food, drink, and have a particular fondness for the smoking of pipe weed. For those of you who don’t know, get on the Netflix and get “The Fellowship of the Ring” on the screen. See the chapter “Concerning Hobbits”. If you’re reading this blog and you don’t know about Hobbits there is definitely something wrong with you. Not that you can’t remedy the situation you. Just do it. So me being a guy who’s building a Hobbit house you know I’ve got to go out and get one of those long stemmed pipes right? I went on line and looked at the Gandalf model. I think they wanted like $239 bucks for it. Okay, I like Gandalf and all but I just want to look the part occasionally. I found a nice enough pipe for about 40 bucks online at some pipe smokers website. Not exactly what I was looking for but definitely works with my budget. Here’s a picture of it. Long Stem pipe, pipe lighter and Longbottom Leaf pipe weed. The hardest part about smoking a pipe? Finding the right pipe weed. I mean you go to these tobacco shops in Manhattan and ask for a pouch of Old Toby or Longbottom Leaf and they look at you like you’ve got two heads or something. I mean what’s up with that?!?!???? Just for the record: I’m not a smoker. Never was and never will be. I think it has to do with my initial foray into the realm of smoking when I was in 7th grade. I tried one of my Father’s Lucky Strikes. To this day I will never understand how anyone could ever inhale something so foul. I never told my father he helped me quit smoking. Thanks Dad! 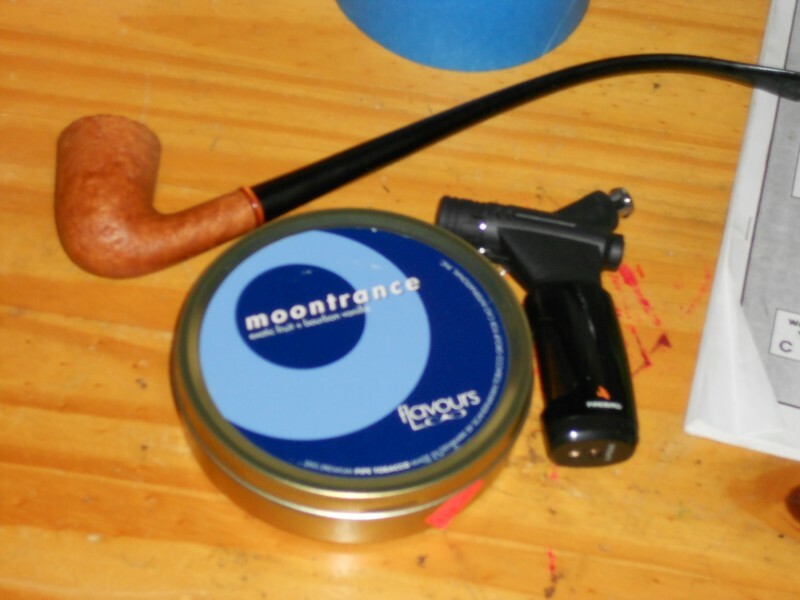 It took quite a few tries but I eventually found a decent Tobacco to use with my pipe. Every once in a while you smell somebody smoking a pipe and it smells so good. It’s like a fruity smell. It has no relation to cigarette or cigar smoke at all. That’s what I’m looking for. If anyone knows a brand and flavor with that kind of aroma please let me know. 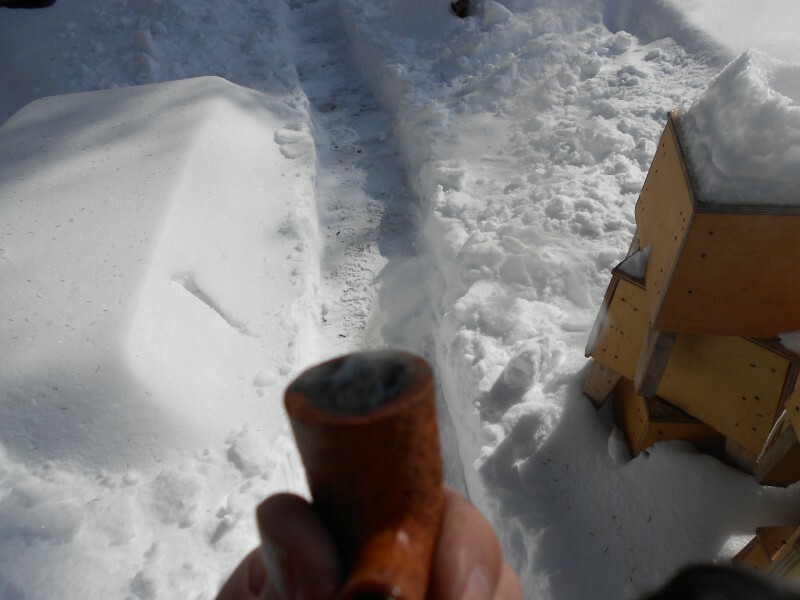 So I took my pipe and tobacco over to the house and relaxed with some pipe weed after I did my shoveling. Here’s a picture. Hobbits: Have a particular fondness for the smoking of pipe weed. I smoked this pipe I think three times in the last year and my wife thinks I have a smoking problem. Geez. It’s just a bit of fun! One more picture of the pipe shall we! Nothing like a bit of Old Toby on a beautiful winter day! So I’m walking along and I notice some droppings. But there are no tracks anywhere near them. Any theories about that one out there? Maybe some kind of a sick deer practical joke? Or….think about this one for a moment. Maybe it was Dasher or Dancer on some sort of recruiting mission? Doing a flyby or something. Boy, oh boy! I hope the weather changes for the better real soon. I think I’m starting to crack up. Let’s pray for better weather, shall we? By the way, it turns out Lucky Strikes were first manufactured in Morgoth’s underground fortress of Angband. (Middle Earth’s first age.) Sold mainly to Balrogs and the higher ranking Orcs of the time. (Later sold to guys like my father from the Woodlawn section of the Bronx.) But again, I digress.